This book serves as a patient advocate ​and an educator for all. In the mid 1980s, the U.S. Centers for Disease Control (CDC) was called in by concerned doctors who were witnessing an influx of patients with a mysterious illness. Eventually the CDC labeled the condition “chronic fatigue syndrome” which turned out to be very misleading. Decades later, in 2016, health agencies are finally beginning to agree with international experts that ME/CFS is a serious, chronic, multi-system illness. Lighting Up a Hidden World: CFS and ME advocates for those too ill to speak out, abounds with patient resources, and offers realistic hope for the future. People living with this illness, along with their family and friends, will find compassion and camaraderie in its pages. This book reaches beyond the ME/CFS community exposing the themes of human suffering, resilience, and the need for social change. 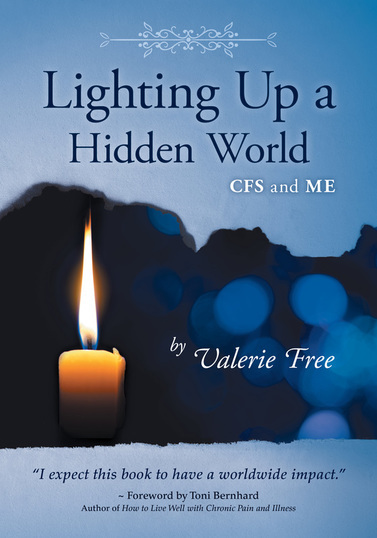 “Val’s book, Lighting Up a Hidden World: CFS and ME is very unique. Her poem, based on the song “My Favorite Things” from The Sound of Music is playful and yet the words to the poem are very serious and upsetting. Using this song makes her writing accessible so it’s not just a rant. A lot of books on ME/CFS are so serious that you can get sick of reading them because the subject is so depressing. Her book has not minced any words, but because of the format and some very cool illustrations, it was a little more playful. I was not expecting to like it as much as I did. I couldn’t put it down because I wanted to see what she had gleaned and how she presented it. I read it from cover to cover within a few days. Lighting Up a Hidden World: CFS and ME is available from most online retailers. **Valerie will respond as soon as she is able. Thank you.